As well as, the theme’s greatest quality of code, extended and easy-to-read documentation and first-class support will make your website creation easier than ever. With powerful Visual Composer page builder, you will no need strive to create any page or content of your cafe and restaurant website. Because Kalvi is fully compatible with Visual Composer and developed with a large collection easy to use drag & drop design elements, so you can take full control over your website. As well as, it saves your huge time consuming on working sites and contents. In Kalvi theme WordPress Customizer is extended with kirki, so you can easily alter the presentation of your WordPress website through the flexible interface with live preview facility. It includes making changes to the page components such as your site title, breadcrumb, widgets, menus… So it is easy for you to create wonderful and meaningful UI. The Slider Revolution is a multipurpose slide presentation solution come with powerful slider customization options. The Kalvi theme is fully compatible with Slider Revolution Plugin. It empowers you to showcase all kinds of contents (text, image, video…) with amazing transition effects and awesome animations. So that, you can catch the users interaction by showcasing your best food items and offers with attractive effects in no time. 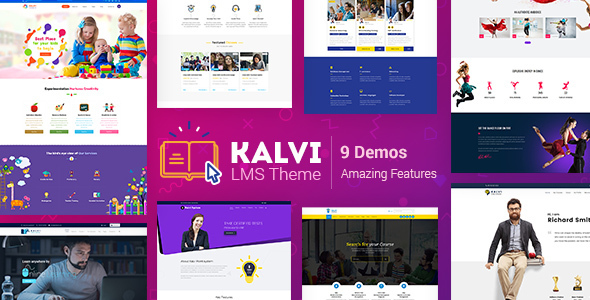 If you want the demo content in Kalvi theme, You can easily import the demo content with a single click through the Unyson Importer. It saves you time and your site would look exactly like the theme demo page. The Events Calendar is a carefully crafted, extensible plugin that lets you easily share your events on your site in an excellent way. Managing events by day, week, month or list is a breeze in Kalvi theme. Since its fully compatible with the Event Calendar plugin. So that you can create your events in an attractive look. The Kalvi is also fully compatible with the Events Calendar PRO. It is the premium version of the Events calendar plugin. The thing you must be remembered is you can get a large collection of good-looking views greater than the free version. Such as view detail, list view, day view, week view pro, map view pro, venue view, organizer view, month view and photo view pro. Another key point, you can customize all these views as you want directly from the backend. Contact Form 7 is a free and popular WordPress plugin which can be used with the theme to create a contact form on your website. The Kalvi theme is fully compatible with the Contact Form 7 plugin. The important key feature, You can edit the default form template of the contact form 7 or create your own contact form easily with the options using the form editor panel. Kalvi is really fully integrated with the Visual Composer WordPress plugin. So each shortcode of our theme has been well designed and created as easy to use. So that, you can build any section or layout easily with or without coding knowledge. A different set of options are also available with the shortcode elements which make you easy to customize the section in visual mode. You can some advanced shortcodes of the theme as follow. The WooCommerce is an easily customizable eCommerce platform for creating the online product selling websites. The Kalvi theme is fully compatible with the WooCommerce plugin, it means you can simply sell your foods products directly from your website. Using the extensive documentation, knowledge base and video tutorials you can get any clarification you may require about Kalvi theme, 24/7.